Turns out the more political material on 'The Joshua Tree' is still quite important 30 years later. There are multiple ways on how the forthcoming presidency of Donald J. Trump can affect you. Some might tend to loose all hope and isolate themselves from any political subjects, others will stand up and fight against the oppression in a more active way. Some artists might get a new political self-understanding while others are spontaneously dropping all current plans. The second part is apparently what Bono and U2 did and what forced them to take another look at their legendary best-selling 1987 album The Joshua Tree. They are even heading onto a big 30th anniversary tour this summer (which is already pretty mich sold-out), playing the record in its entirety for the very first time. It’s kind of an interesting move for a band that’s been trying so desperately to stay relevant in the past years while ultimately failing to do so in the end. U2 are finally embracing their age and legacy status, so what happened? Well, obviously Donald Trump happened. While the band has been working for way too long on their new Songs Of Exprience album the world took a quick and slightly bad turn in 2016 and since it’s about time to save the planet again you can bet your favourite sunglasses that Bono will jump on that bandwagon. Look, I get it, U2 are a tricky band, Bono remains a discussable character and The Joshua Tree isn’t quite a cool album (We all know that 1991’s Achtung Baby is way better anyway, right?) but then there’s a track like Bullet The Blue Sky which hasn’t lost its power and – unfortunately – relevance over the past thirty years. Placed at the fourth position within The Johsua Tree this almost industrial like blues rocker gives the album a surprisingly hard twist at this point (after all it comes directly after With Or Without You). It’s a dirty and grim reckoning with the conservatice United States under Ronald Reagan in the 1980s. Bono criticizes the country’s thirst for war and political corruption while even getting biblical in his rant. Bullet The Blue Sky is a mighty monster against nationalism and militarism and in that form one of U2‘s strongest statements, one that hasn’t lost its meaning. During a show shortly before Trump’s election last year the group performed it as a directly addressed ode to Trump. You can see bootleg footage of it below and a better version of Bono’s ‘dialog’ with the king of Tweets right here. 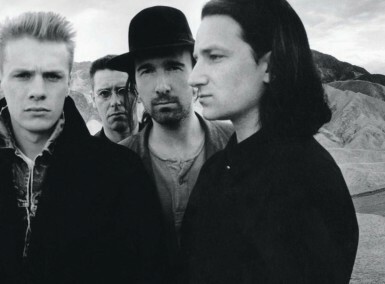 A lot on The Joshua Tree is lyrically connected to this conservative and anti-liberal period of time in the USA and also the UK under Thatcher 30 years ago and according to the four-piece the current, almost extremer cirumstances ‘forced’ them to get these songs back on their agenda. It’s probably a bit sad to see that we haven’t come that far as a society in the past decades as we hoped for but it’s never too late. So, whether you are joining Bono’s reflective look back or not but sitting still is no option anymore. ‘Outside is America’ … and the rest of the world as well. Don’t forget that.